Super Bowl Party at Casa de Pico! 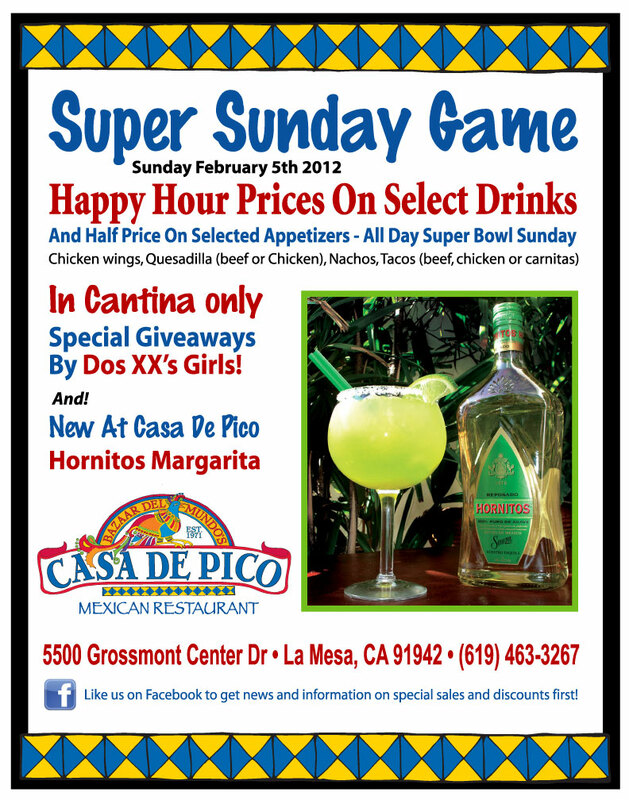 La Mesa Mexican Restaurant Casa de Pico throwing one heck of a party on Super Bowl Sunday! 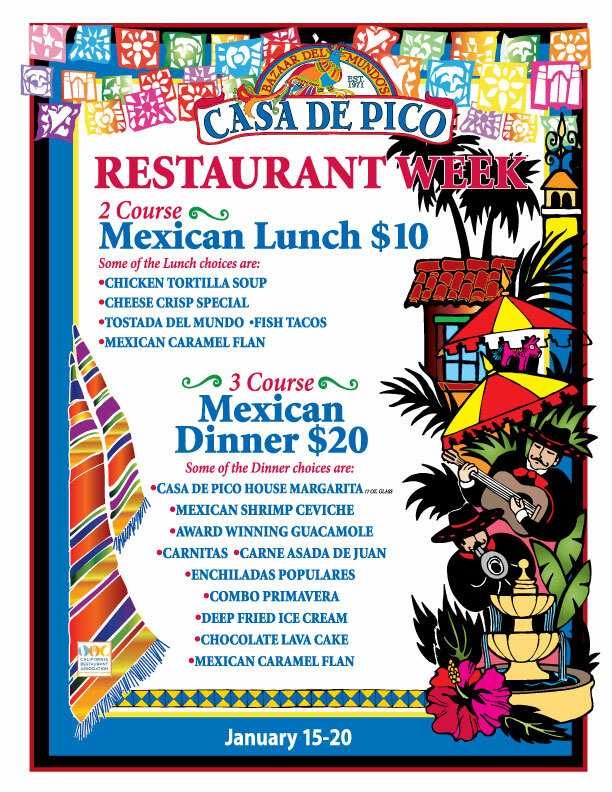 Casa de Pico participating in San Diego Restaurant Week starting this Sunday! It was such a smashing success last year and our customers loved it so much that Casa de Pico is participating again this year in San Diego Restaurant Week starting this Sunday and running through this Friday, January 15 – 20. We’ll be offering our usual superb meals at special prices all week. Come see us. We’re open Mon – Sat 11:00 AM – 10:00 PM and Sundays 10:00 AM – 10:00 PM. Happy Hour is Mon-Fri from 3 PM until 7 PM in our Cantina. We look forward to seeing you! The “Gluten Free” Menu at Casa de Pico is just like our portions: large and delicious! The people’s choice for best mexican restaurant La Mesa is hands-down Casa de Pico. We received three awards from the East County Californian in September: Best Mexican Restaurant, Best Lunch and Best Ambiance. It’s our attention to detail that separates us from the pack, and we’ve developed the most variety filled Gluten Free Menu you’ll find. Complete details are at www.casadepico.com. Just click on “Menus” at the top of the page, then click on the box that say’s “Gluten Free Menu” and our entire selection will open for you. What is gluten? It’s a protein that helps make wheat, barley and other grains have a “chewy texture”. It also makes a small percentage of the population ill. We want all of our customers to leave our restaurant feeling satisfied, and healthy. That’s why Casa de Pico developed such an extensive gluten free menu. For forty years Casa de Pico has provided our customers with authentic Mexican atmosphere and dining. Come and visit us and you’ll see that we have something for everyone. Your health matters to us. Casa de Pico: We’re looking forward to sharing 2012 with you! Well, we survived the holidays! The hustle and bustle, shopping, out of town visitors, travels to see family and friends…it’s all over! And now it’s 2012 and the beginning of what we hope is a great year for you and your friends and families. Casa de Pico will continue to celebrate our 40th anniversary throughout the year with great dining specials and who knows, maybe a surprise event or two thrown in as well! Come and enjoy the special events of your life with us, like birthdays, wedding rehearsal dinners and receptions, catering for your business events…any occasion at which you want to enjoy the best La Mesa Mexican Restaurant. We love serving you! And of course there are the fun-filled national holidays like St. Patrick’s Day, Cinco de Mayo, Mothers Day, Fathers Day, Mexican Independence Day and more. We all want to thank you for making 2011 a great year for Casa de Pico and we look forward to serving you throughout 2012. Come see us often and enjoy the authentic feeling of Mexico in beautiful La Mesa.